first base in spring training? The “Welcome To Calera” sign is supposed to be redone this year. Virgil’s name will be added. However, a Calera Chamber of Commerce representative seemed a bit perplexed when I asked why NASCAR driver Hut Stricklin (who has since moved) was recognized, but not Virgil Trucks. Answer: only one man is FROM Calera. I think being a native son is overrated. Virgil Trucks, born in nearby Birmingham in 1917, CHOSE Calera. He’s still living in Calera. Two reasons I’d move his name to the top of any sign. 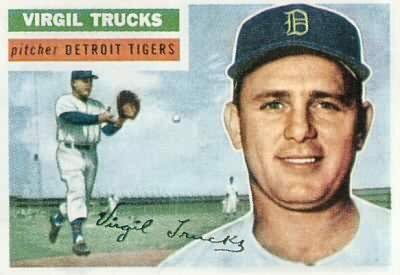 I found little consolation upon hearing the Chamber rep say that the Calera Historical Society would be meeting in July, and that would be a good time to mention Mr. Trucks. Virgil Trucks is LIVING history. Celebrate him NOW. For years, I lived in Marshalltown, Iowa. Cubs fans who read my published work would call or send e-mail. Since I lived in the birthplace of baseball Hall of Famer Cap Anson, fans asked: what landmarks were there to visit? I could have told them I once lived on Anson Street, played in Anson Park and attended Anson School. Trouble is, all were named after town founder Henry Anson, Cap’s father. I begged Marshalltown to do something. Do anything! No way. Too controversial. Status quo, please. Virgil Trucks would be a joy to promote, compared to Anson, the 19th century version of Billy Martin. Let’s hope Calera agrees while the Trucks family can still enjoy the well-deserved accolades.